Letting government programs dictate your management and set priorities can be costly. The most obvious example is probably the emergency feed program. In drought impacted areas, this program incentivizes ranchers not to destock. The result has been severe overstocking during drought, when the impacts of bad management are intensified. Even programs like EQUIP (Environmental Quality Incentives Program) which offers cost sharing to producers for practices that conserve natural resources can lead to some costly decisions. Consider the case of a producer I met at a cell grazing workshop. He told me that he was going to apply for EQIP funding for fencing and water development so he could start cell grazing. He said his ranch had too much bare soil, too few perennial grasses and a lot of potential. He guessed that it might be possible to double the carrying capacity from 250 cows to 500 within 5 years. He was certain that the fences would improve utilization and push cows to areas that have been virtually untouched. That alone would enable him to carry 50 more cows immediately. He’s probably right about the potential to increase the carrying capacity. 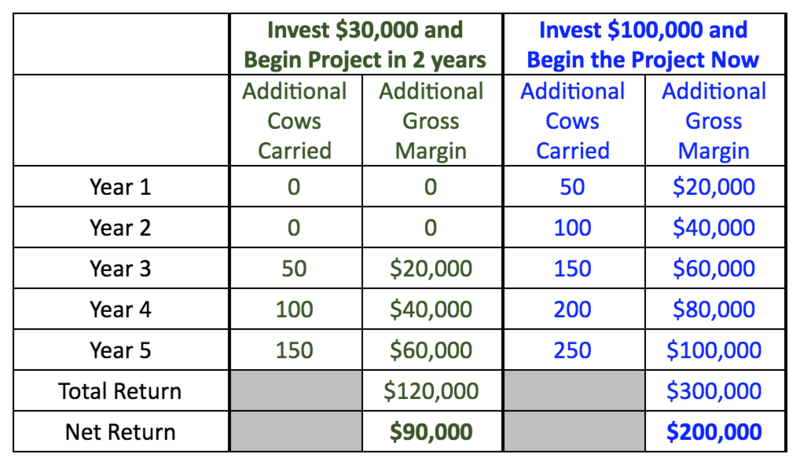 Many RFP grads who’ve implemented cell grazing have doubled the carrying capacity of their ranches, and the more degraded the ranch, the more room there is to improve. He expected the project to cost $100,000. His portion would have been $30,000 with EQUIP picking up the rest. While he was eager to get on with the project, he’d missed the deadline for submitting projects and said that he was going to wait until next year to apply. Even then, the review and approval process would take time. He figured it could be two more full grazing seasons before they started building. “But we’d be crazy to turn down $70,000 of free money,” he said. It might be crazier to wait for the free money. To explain why, we need to make some guesses about how much carrying capacity will change and over what period of time. We know that he’ll be able to increase the stocking rate by at least 50 cows in year 1. Let’s say the rate of increase is steady over the next 4 years and in 5 years the ranch is able to support 500 cows, 250 more than it supports now. Let’s also guess that the gross margin of his cows is $400/head. Let’s say he decides to wait for the free money. If our numbers are in the ballpark the cumulative net return from his investment after 5 years will be $90,000. If he doesn’t wait for the free money, and instead funds the project himself, the cumulative net return from his investment after 5 years would be 200,000. Waiting for the free money cost him over $100,000! We can’t know for certain if the project will produce these results. The point is, if the project is worth doing, it is worth doing on our own timeline, to our own specs, with our own money. If “free money” happens to be available for something you were going to do anyway, and you are comfortable participating in government programs, you might as well grab the cash. But if free money causes you to do something you weren’t going to do, or alters your timeline for doing it, it could be a costly mistake.